Made the final payment on my trailer! Woo hoo! Now I can really start thinking about getting rid of this dump with the ever-increasing lot rent and get a real house! Plus I made another final payment on my student loan. Not so woo hoo. I printed everything out this time so I have proof that I paid the pay off amount. The next couple of weeks are going to be extremely tight, but after that I'll be solvent. I'll still have to budget carefully, but at least my income will cover my expenses and I won't have to bite my nails waiting for child support to buy food and other necessities. I finally got the pictures from my camera, so I can post some of the things I've been working on during the last month. This actually isn't everything. I didn't get pictures of everything because my camera doesn't seem to want to power up and I've been too lazy to scan anything. I've decided I really hate stitching HAEDs on Jobelan, so I'm going to restart those. Here is Salamander, which I restarted on 25 count Baby Lotion Lugana. Over Labor Day weekend I got an incredible urge to work on something pink. So I started Sea of Roses -- which is actually one of the first HAEDs I purchased. 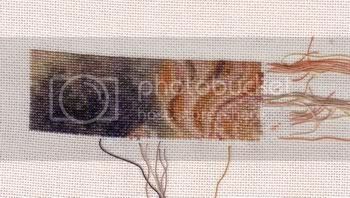 I'm leaving out the background and am stitching her on 25 count Strawberry Sparkle Reflections Lugana from Silkweaver. The stuff is not easy to stitch on, but I sure do love the sparkle! 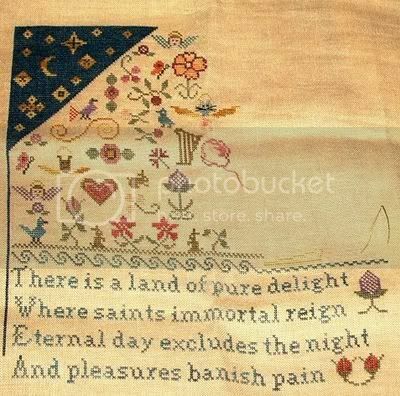 Before I got the pink urge, I felt like stitching some nice, relaxing blue. So I worked on Storykeeper. And last, but not least, I got some more done on Heaven Above. I think I've changed my mind about this sampler, though. I love the design and actually purchased the chart prior to my brother's death. But the more I work on it, the more uneasy I am about giving it to my sister-in-law. Particularly after talking to my mom. She's probably going to be the one getting it framed and then give it as a Christmas gift. I certainly feel more comfortable with that. So today I'm going to start on The Memorial Sampler, which is the one my mom liked. The plan is to keep working on it until it's finished, since I need to have it done by Thanksgiving. We'll see how well that goes! And now for some pictures of my lovely children. 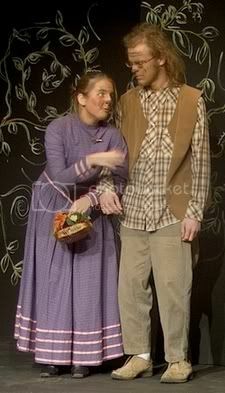 Here is my son and his girlfriend as Mr. and Mrs. Beaver in The Lion, the Witch and the Wardrobe. I was very disappointed with the pictures I got. Most of them were blurry, because the shutter stays open too long with no flash. Or overexposed because of the stage lighting. One of the first things I'm going to purchase when I'm solvent is a new camera. I've already got it picked out -- since my kids are so involved with theater I'm getting one with a 12x zoom. I can't wait! The production itself was fabulous. 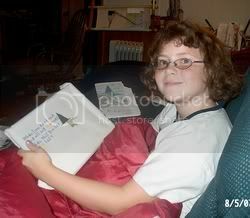 And here is a picture of my daughter, following in her mom's footsteps! 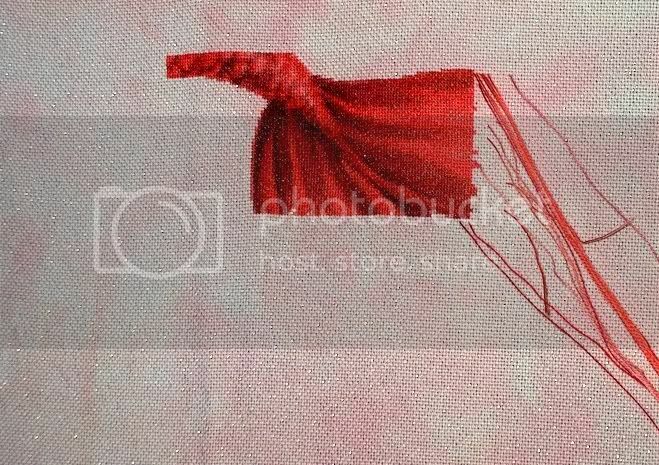 Quite a picture intensive post! I hope it didn't cause any one's computer to go into fits. I will try not to wait so long before my next update!! Sometimes I just want to give up. I checked my student loan account so I could see the lovely zero balance and according to them I still owe $9. So the 10 day payoff amount is a great big fat lie. And of course the people in India who do the customer support can't do anything about it -- I don't think she was even able to pull any more information up about my account than I can (which only shows current amount due and payments made, nothing about how much was due last month -- which should clearly show that I paid the total amount due). I know $10 is no big deal, but it’s the idea of the thing. Silly, I know, but I just want to cry. I finally got through to Verizon and got my account re-enabled. Obviously since my template is once again working correctly. You may recall a while ago a lovely person (who I thank again!) sent me a HAED gift certificate. I was very happy to have it yesterday when I discovered Selena Fenech's Dragon Skies had finally been released. I've been waiting for it and I wouldn't have been able to purchase it without the gift certificate. Thank you, thank you!! I was going to start it last night but after seeing the amount of white used in the design (the top pages are almost entirely white and Kreinik 032! 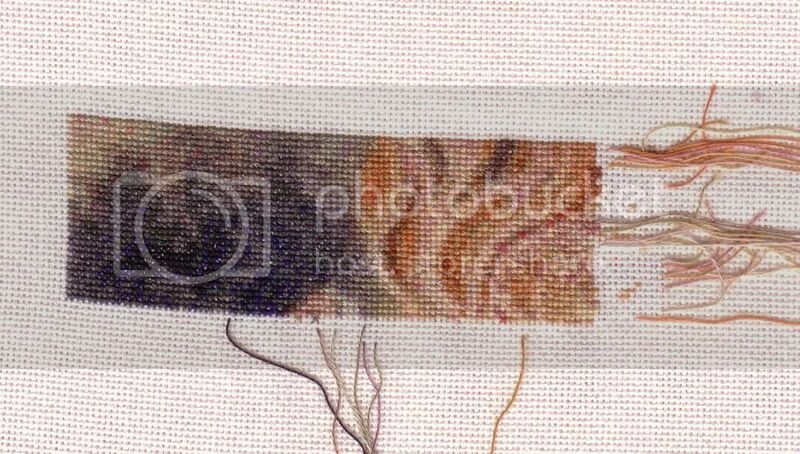 ), I decided I'd go insane trying to stitch it on the antique white lugana I planned to use. I have a fat quarter of Lavender Bliss and I almost used that, but good sense got the better of me and I decided a one inch margin on the left and right would really be pushing it! So I'll need to order a fat half, which will have to wait a bit. Ah, well. Waiting probably won't kill me. I have to admit I was a bit disappointed with the chart itself. I can't see how all that white (with bits of 032) is going to translate into the top portion of the imagine. It's very delicate, but there is some color and definition. So I think I'll just skip the first 60 rows (which are 99% white). My account with Verizon doesn't seem to be working. Which is where I have the style sheet for my template. I imagine it has something to do with cancelling my service temporarily in order to get the phone and internet on one account. I've got the same id and my connection is working but my e-mail and web pages have been suspended. Lovely. After the struggle getting my phone to work I guess I shouldn't be surprised. Do I really want to get my TV service with them?